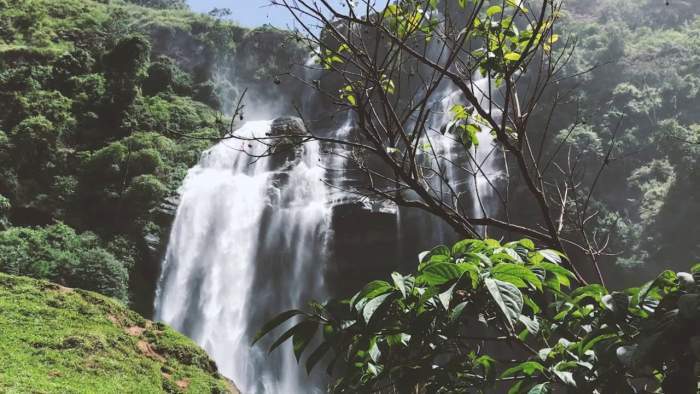 10 Best Waterfalls In Hatton, Sri Lanka, To Soothe Your Eyes And Soul: A beautiful mountainous area in Central Sri Lanka is Hatton. The Hattan hill is surrounded by tea bushes and can be described only in one-word, Green. This region receives more than average rainfall and hence it is surrounded by lush vegetation. Mornings of Hatton Houghton is usually surrounded by haze and as the sun sets, you can get a glimpse of the beautiful Adam’s peak and panoramic hilly landscape. In Sri Lanka, there is a lot to seek through in this hilly which includes plenty of waterfalls. Hatton is blessed with some of the amazing waterfalls that you would love to visit. The specialty of Hatton is its cool weather and high average rainfall. Other than the monsoon season, the region receives odd rainfall almost all season around. The best time to visit Hatton is perhaps from January to April because the day temperature lasts around 28 degrees and it is also relatively dry during this time. Although it is possible to go to this place throughout the year, all you need is you’ve to be ready for the rainfall. Hatton has a wide variety of waterfalls. Wandering in this mountainous country region, you will come across many amazing waterfalls. Here we have assembled a list of 10 Hatton Waterfalls, which are worth visiting on your next adventure trip of Hatton. 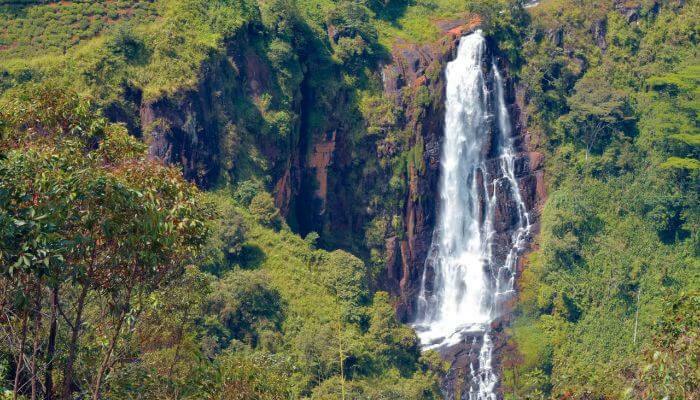 Laxapana Falls is acknowledged to be the 7th highest waterfall in Sri Lanka with an altitude of 126 meters. 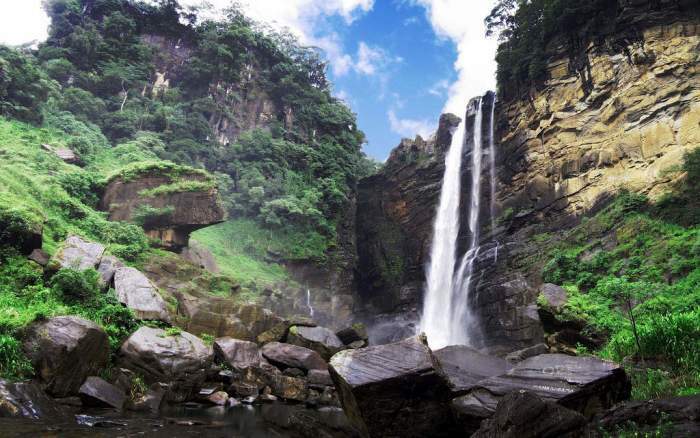 It is located in Maskeliya Oya and offers a spectacular view of the water cascading down the rock. Earlier the flow of water was in abundance, which has now reduced with the construction of the dam. Before falling into the face of the rock below, the water beautifully rushes over large rocks. Where: Nuwara Eliya, Sri Lanka. Nearby Attractions: Aberdeen Waterfall, Kadiyanlena Falls, Castlereagh Reservoir. St. Clair Falls is another popular waterfall in this area. It is one of the most detailed waterfalls in the country, to that extent that it is also called “Little Niagara of Sri Lanka”. The waterfall gushes down a cliff structure before it finally cascades down in three different sections at it cut across down into a pool. 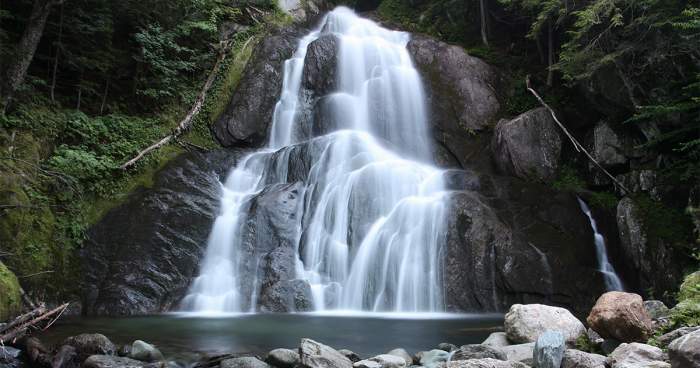 Surrounded by heavenly green tea plantation, St. Clair’s waterfalls offers a stunning view. Nearby Attractions: Devon Falls, Mlesna Tea Castle, Shri Bhakta Hanuman Temple, Ramboda Waterfall, Bluefield Tea Gardens, Lover’s Leap Falls, Hakgala Botanic Gardens, Gregory Lake, Warleigh Church, Sri Baktha Hanuman Temple, Nuwara Eliya Golf Course. Devon Falls is also one of the popular waterfalls in the Hatton area and has scenic views from different sides. It offers an amazing and clear view from Hatton- Nuwara Eliya Road and the best view of this waterfall is possibly from Dimbula, where you can get a special viewpoint. Even across the street, there’s a Mlesna Tea Center, where you can enjoy a fresh cup of tea on your journey. Nearby Attractions: Mlesna Tea Castle, Chandis SriLankan Tours, Shri Bhakta Hanuman Temple, Ramboda Waterfall, Bluefield Tea Gardens, Hakgala Botanic Gardens. Glen Falls explore its beauty near the Lover’s Leap Waterfalls, this waterfall is a “observe from distance” kind of waterfall. Also, the waterfall is a seasonal one, which means that it gets dried in the summer season. But that does not mean that this waterfall is not equally beautiful. The waterfall is drenched in the middle of greenery and tea gardens, making the view even more soothing and pleasing to watch. Aberdeen Waterfalls is a 98 m high waterfalls, which is located near the Laxapana waterfall. If you are visiting Nuwara Eliya, then a must-visit tag goes with it. There are two pools in the waterfall and a very panoramic view from below. However, to reach the pool on the base of the waterfall, some hiking will be required. So make sure you are ready for long hiking before reaching the waterfall. You’ll find the hike worth unless you reach the base pool, as it offers a superb convenient point with the water beautifully cascades down. Nearby Attractions: Warleigh Church,Sri Lanka Trekking Tours, Xclusive Adventures – Day Tours. 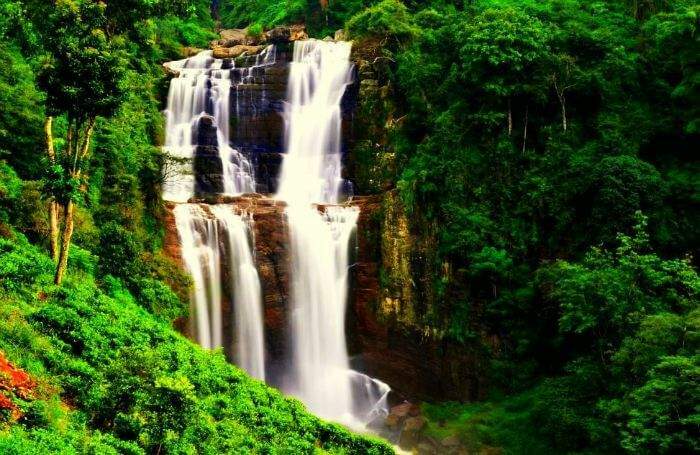 Ratna Ella waterfalls, located in Mahiyangana, is another beautiful waterfall in this picturesque region. To reach the waterfall, you have to go through the lush green forests. The hike is quite comforting. After about 45 minutes of walk, you will reach the site of this beautiful waterfall. The waterfall is about 101 meters high and water flow is used in paddy fields. As per the tales from past, deep within the waters of waterfalls, seven vessels filled with precious stones are hidden. Among the folklore is that seven vessels full of deep stones are hidden inside the water of the spring. Nearby Attractions: Loolkandura, Sembuwatta Reach, Victoria Golf & Country Resort. This waterfall has its origination from the Nanu Oya River and flows through Udaadala before falling below the sequence of 25 steps. This is a cascading waterfall and as soon as the waterfalls gush down through so many steps, it creates a beautiful foggy effect. You can get some views of the waterfalls from the main road, but to reach the waterfall, you have to take a road from the railway station and travel around 1.5 km. Nearby Attractions: Glassaugh Falls, Lover’s Leap Falls, Devon Falls, Ramboda Waterfall. 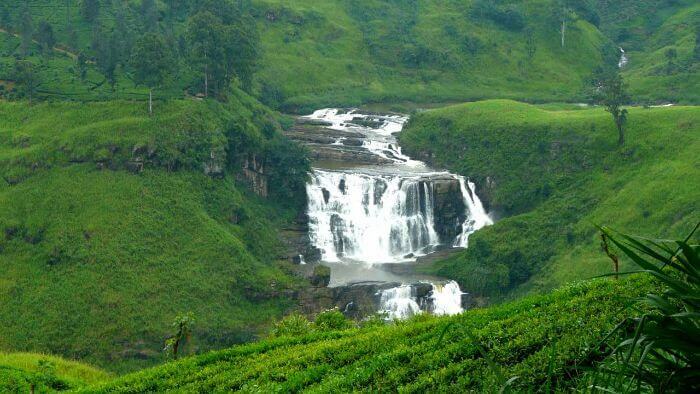 Bomburu Ella Falls is also known as Perawella Falls, is located in the Nuwara Eliya district. Unlike other waterfalls, it is not a single waterfall, but a collection of 10 small jungle falls. The waterfall is served by the Duulgal River, a tributary of the Uma River. To go to the falls, you have to complete a track down the forest amidst the big rocks. Nearby Attractions: Victoria Park, Pedro Tea Estate, Gregory Lake, bale Bazaar, Strawberry Fields, Ambewela Farm, Seetha Amman Kovil, Hakgala Botanical Garden. Mount Vernon, a small 12-meter high waterfall in the area of Nuwara Eliya. 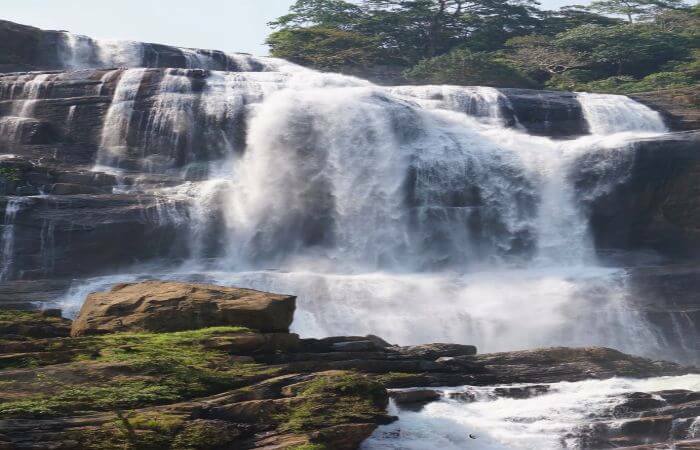 This waterfall is less known among travelers, but if you ask a local of the Nuwara Eliya district, they will guide you to waterfall. The waterfall is located well into the tea estates and is not visible from the main road, you’ve to travel a bit through the tea plantations to reach the waterfall but the view of the waterfall and the road leading to the waterfall is very captivating. Nearby Attractions: Schnormeier Gardens,Kokosing Gap Trail, Tree Frog Canopy Tours Zipline. This is another hidden waterfall in this area. 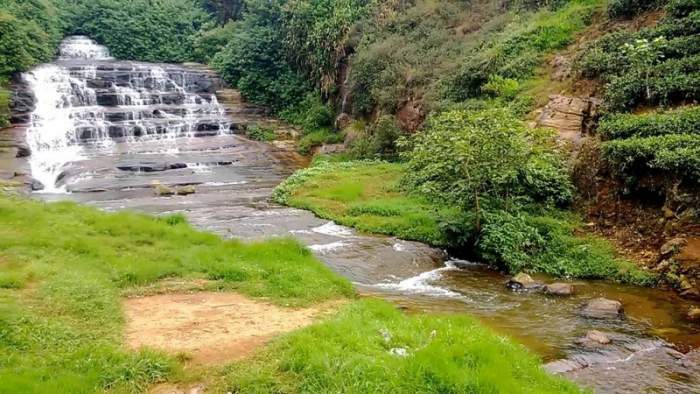 The waterfall is very beautiful and if you are traveling through a vehicle, then you can reach Gelboda tea factory and then a 2.5 km walk will take you to this lovely waterfall. There are a lot of huts and children park around the falls and there is also a snack bar if you feel hungry while on your visit to the fall. Nearby Attractions: Amboli Falls, Madhavgad Fort, Shirgaonkar Point, Hiranya Keshi Temple. The best way to reach Hatton is by the railway route. You can board a train from Colombo which passes through the Kandy and slowly climbs on the hill and soon you will see tea plantations and Scottish like highlands. Hatton’s journey is magic in itself because you get to see some wonderful views of the mountainous landscape.